Casey (left) and Noah Kegley following their joint ordination on June 10, 2018. Casey (’13) and Noah Kegley (’14) aren’t just brothers. The siblings, a year apart in age, have also been classmates and teammates for most of their lives, attending grade school, high school, college, and seminary together. Now the two are partners in ministry. 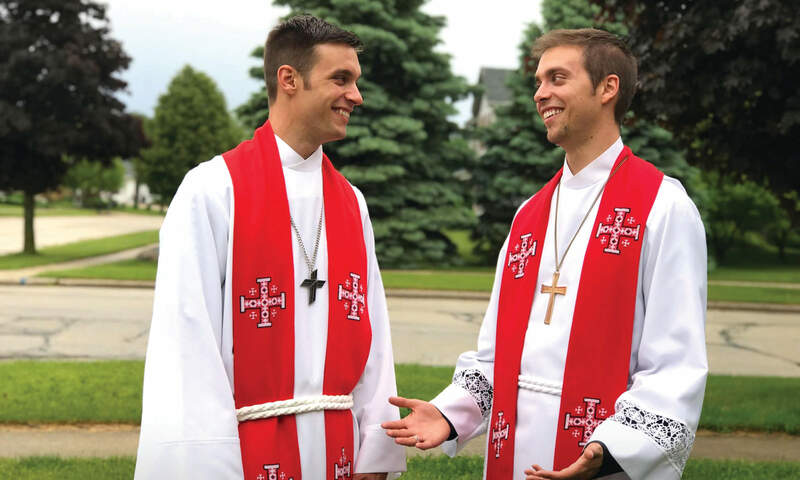 Ordained into The Lutheran Church–Missouri Synod pastoral ministry together on June 10, 2018 at their home congregation of St. Paul Lutheran Church in Grafton, Wisconsin, the brothers are now serving at their first calls as associate pastors: Casey at Bethlehem Lutheran Church in Ridgewood, New Jersey; and Noah at St. Paul’s Lutheran Church and School in West Allis, Wisconsin. The Kegley brothers are the first in their family to become pastors. They attribute their parents, teachers, coaches, and youth leaders as being great mentors of faith and demonstrators of God’s love who encouraged them to consider their pastoral pursuits at Concordia University Wisconsin. The spring Concordian hit mailboxes the week of October 1. View a PDF version of the magazine here. If you are not on our mailing list, but are interested in receiving a free copy, call (262) 243-4333.